Wed., Oct. 19, 2016, 7:49 a.m.
A GRIP ON SPORTS • It’s cleaning day here at the house, so it seems like a good day to clean up a few things on the blog as well. Read on. • Larry Stone has an interesting column this morning on the Seahawks and how they may react to Richard Sherman’s meltdown on Sunday. The bottom line is simple. Stone doesn’t see it being a pothole. The culture – yes, I know, it’s an overused word these days – Pete Carroll has developed in Seattle seems built for such moments. Carroll has developed a knack over the years of knowing when to interject himself into a team’s problems and when to let it work it out alone. It’s not perfect but, ultimately, his spidey-sense is pretty good in this regard. Stone posits the Hawks will turn into a positive what most team would view as a negative, a big negative. And he’s right. Somewhere in December we will be pointing to Oct. 16 as a launch point for the season. • So let me see if I get this right. The past two years, players from Washington State and UCLA have collided in pregame warmups. It hasn’t happened between the Cougars and any other school. Gabe Marks comments about it. And UCLA coach Jim Mora says Marks is misinformed, his team follows the rules. OK then. Except there is a flaw in this logic. Yes, teams often warmup on both sides of the field – as long as the other team has yet to leave the lockerroom. When that happens, the team using the wrong side immediately skedaddles to its 50-yards of turf. UCLA has a tendency to hang around. The players did last year in the Rose Bowl. They did it last weekend in Martin Stadium. It causes a problem. Someday it may cause a bigger problem. It needs to stop. • Gonzaga has two players up for major position awards – thus far. Both are transfers. Point guard Nigel Williams-Goss is on the Bob Cousy watch list. He came to Spokane from the University of Washington. Shooting guard Jordan Matthews is on the Jerry West watch list. He was a California Golden Bear before he graduated and headed north to Gonzaga. Recruiting these days doesn’t stop with high school and junior college players. With the number of transfers looking for a better fit, every college coaching staff must mine that pool of talent if they want to remain competitive. Few do it better than Mark Few’s staff. You will get to see the two play together for the first time when the Zags open the season with an exhibition game against West Georgia on Nov. 5. The first game that counts is Nov. 11 against Utah Valley. By the way, Athlon has a team preview of the Zags today. • The saga of the summer-time miscues from WSU’s football team continues to roll on, with Robert Barber no longer facing expulsion from Washington State. Instead, the big defensive tackle is going to be suspended from the school. Someday. Barber, who appealed his expulsion and saw it reduced to a suspension, is appealing to have his suspension suspended until spring semester. Got it? If that happens, he’ll be able to finish his last season as a football player – he’s a redshirt senior – and then deal with the punishment for his role in an offseason brawl. Well, his school-based punishment. The legal ramifications are still to be determined and that might torpedo Barber’s football participation before the appeal is finished. • One last thought. I wonder how sales are going today in New England for Microsoft’s Surface tablet. They received the Bill Belichick seal of disapproval yesterday and, north of New York City, that could be a death knell. • WSU: We’ll start today with Jacob Thorpe’s story on the Barber situation. Jacob also has a story on the Arizona State quarterback situation and post-practice videos with Alex Grinch and Mike Leach. WSU is fourth in Jacob’s Pac-12 power rankings this week. ... Leach mentioned this week Arizona State’s ability to decode sideline signals. 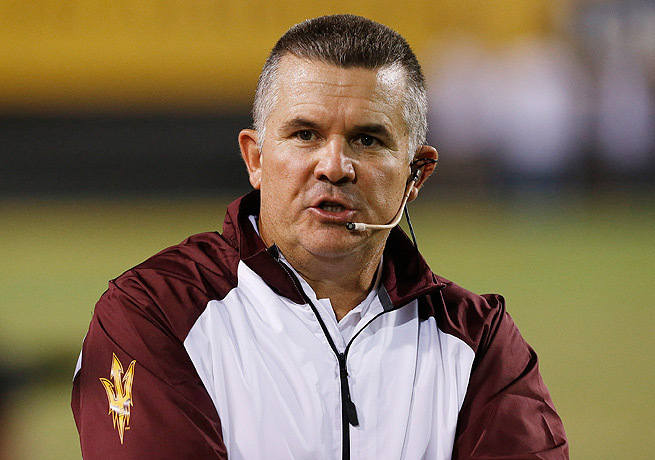 That provoked a response from ASU coach Todd Graham, who was adamant the Sun Devils don’t break the rules. ... For the second consecutive week, the Cougs will face a team that believes its offensive line needs to block better in the running game. Elsewhere in the Pac-12, we still can offer even more power rankings as well as quarterback rankings and a midseason all-conference team. ... Stanford, which got well a bit last weekend against whistle-happy Notre Dame, will need to know where Colorado linebacker Addison Gilliam is at all times. ... You know when a coach is saying they “haven’t lost our kids,” then something is wrong. That’s the case in Oregon as it prepares to play a California team that will have its quarterback returning this week. ... What type of passing offense will Oregon State bring to Husky Stadium? By its admission, a “horrible” one. That’s not good when you are playing a top-five team with a top-five defense. ... Utah has a couple players on the defensive side of the football that will lead the way in this Saturday’s battle against UCLA. ... USC and Arizona have byes this week. • EWU: The Eagles’ volleyball team is young. But, as Jim Meehan writes in his college volleyball notebook, that hasn’t kept them from being really good. ... On the football field, the Eagles’ offensive line is young as well. And, as Jim Allen writes, that hasn’t kept them from being really good either. ... Around the Big Sky, Montana State knows it has to play with more energy this Saturday against Eastern. ... Montana's defense has been playing in the opponent's backfield a lot. ... North Dakota is trying to balance its athletic budget but the president said yesterday it will not be cutting sports. ... The Southern Utah/Weber State rivalry is growing in significance. • Chiefs: Great goalie play allowed the Chiefs to break their three-game losing streak with a 2-1 win over visiting Everett last night. Tom Clouse was at the Arena and has this story. Colin Mulvany was also there and has this photo report. ... Tri-City opened a road trip with a 4-3 win at Portland. • Preps: It’s not yet November and we are already into state playoffs. Greg Lee has this feature on Lake City’s Havana Johnson, who will lead the Timberwolves into the State 5A soccer tournament. ... We also can offer a roundup of yesterday’s prep action. • Seahawks: Other than the on-going coverage of Sherman’s Sunday rant, there is also some thought spent on the evolution of the Hawks’ offense. The running game is taking a backseat to Russell Wilson and the passing game. ... One of the passing game’s weapons, tight end Luke Willson, underwent arthroscopic surgery yesterday, which may mean he will return this season. ... As per usual, the Hawks made some roster moves yesterday. • Sounders: Zach Scott, who played his college soccer at Gonzaga, will retire at the end of the season. The team will hand out bobbleheads Sunday to honor him. ... There is a bit of a disagreement concerning a Dallas star’s injury suffered late in the match last weekend. Vince Grippi is a freelance local sports blogger for spokesman.com. He also contributes to the SportsLink Blog.